This post was submitted by Ballentine of the Sunset Activist Collective, via the CopBlock.org Submissions page. Ballentine was also a member of the “Sunset Four,” a group of Las Vegas activists who were arrested in August of 2013 for protesting against police brutality and other crimes by the police. 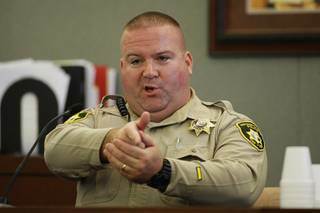 After multiple attempts, law enforcement in Southern Nevada succeeded in forcing the Clark County Commission to pass a sales tax measure to fund the hiring of more police officers. The vote itself was a forgone conclusion, which many people who spoke at the hearing eluded to. Only Commissioner Chris Giunchigliani voted against passage and for the wrong reasons, that she was against sales taxes not the police. I fault her as well for not standing up to the police. The truth is that, according to the US Government, you are eight times more likely to be killed by law enforcement than in the War on Terror. 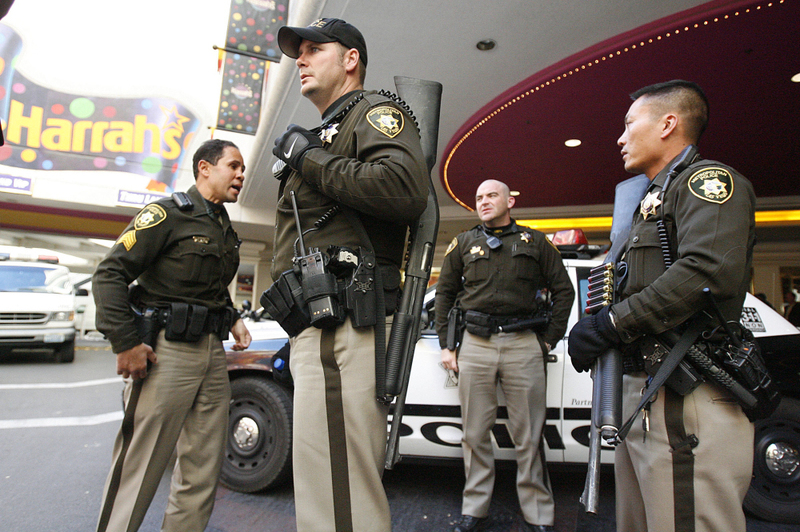 People in Nevada have good reason to fear the police. Local law enforcement serves corporations, not the public, and this was clear by the corporate representation that was present at today’s hearing. Wynn resorts, the AFL-CIO, Caesars Entertainment and NV Energy to name just a few. Even Mcmullin’s Pub came in to support this robbery. Law enforcement likes to pretend they are outgunned at major events, but the reality is that businesses are already forced to pay for police officer security when their events have more than 100 people in attendance. The justification for this tax was fear. From Commissioner Marilyn Kirkpatrick suggesting the tiny hamlet of Mesquite has a gang problem, to union reps claiming that the situation on the Strip is “out of control” fear was used to sell this. For all his sweet talking of law enforcement, we need to remember that Former Sheriff Gillespie had a secret meeting to dig up dirt on Chairman Steve Sisolak that they could use to blackmail him into complying with this vote after the last time it failed. I have to wonder what they discovered about him. I’m also irked that even more of my money will go to pay for the murder of unarmed people of color, which the commission in opting not to address the issue of the police never being put on trial has given approval to a culture where black lives don’t matter. Commissioner Lawrence Weekly went so far as to admit “there are probably people in jail who don’t belong there, that belong in the hospital.” By acknowledging such an issue, but then approving the money to increase the likelihood that this will continue, he is in league with the police state. It’s concerning that people still think elections will do anything meaningful. “Go vote” law enforcement will tell you, but for who exactly? Not one person sitting on that commission had the right idea and they should be ashamed of their actions. After I spoke several people came to me and thanked me for my comments. As a retired teacher I know that local government holds these hearings during the day to make it so working people can’t comment. 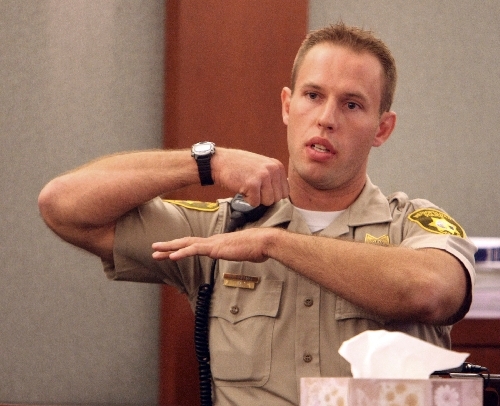 As a victim of police brutality, I am saddened that the body count of Nevada law enforcement will continue to climb. If local government is so cowardly and likes to use fear as a tactic then I say maybe we should speak their language. Maybe Las Vegas needs a riot. Maybe people should boycott Clark County businesses. I don’t know about you, but having a police state doesn’t make me feel safer it makes me want to stay away from that city. If I’m given the choice of a vacation without police harassment or with lots of it, I’m picking without. I urge anyone who owns a business to deny free services or any service for law enforcement. Stop coddling these overpaid murderers. We need to stand up to them and not allow law enforcement to threaten attacks or reduction in services that the figures show they have ample money and manpower to address. I really have to wonder where the hypocrisy stops, I feel we are heading toward a confrontation based on corporate supported racist police forces and that any “incident” that occurs will be the direct result of ignoring the issue of out of control law enforcement.